Two days before the third State of the Nation Address (SONA) of President Rodrigo Duterte, various church groups and marchers from Southern Tagalog set foot at the “Kampuhan Kontra Kontraktwalisasyon” (KKK) protest camp in Mendiola in Manila today to express their solidarity to the Filipino workers’ call to end labor contractualization in the country. Church people held a mass at the camp this afternoon, in anticipation of the ‘Lakbayanis’ from Southern Tagalog who are on their fifth day of journeying to Manila from Calamba, Laguna. 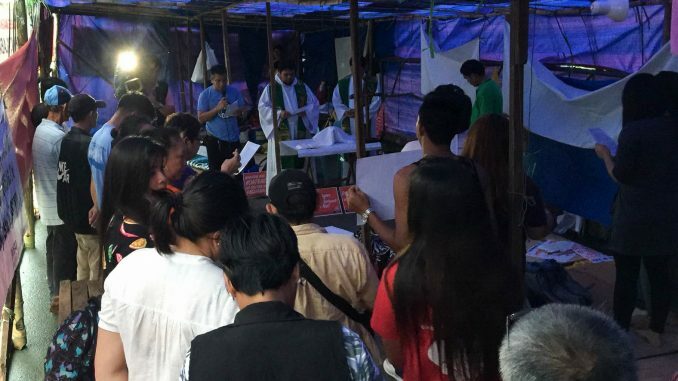 Workers, church people, and support groups hold a mass at the protest camp in Mendiola. Photo by Katrina Yamzon. Organizations from Southern Tagalog were dispersed by police earlier while protesting near the U.S. Embassy in Manila. Seventeen people were reported injured by the violent dispersal. Terminated contractual workers from different companies started to mount a five-day anti-contractualization camp in Mendiola on Wednesday, which will culminate in what progressive groups dub a the ‘United People’s SONA’ simultaneous to President Rodrigo Duterte’s third State of the Nation Address (SONA) on Monday. Displaced outsourced workers of the Philippine Long Distance Telephone Company (PLDT), Jollibee Foods Corporation (JFC), Slord Development Corporation (makers of UniPak sardines), Manila Harbour Center, Pearl Island, and members of Liga ng mga Manggagawa sa Valenzuela City call for their reinstatement and for their respective companies and the Duterte government to immediately regularize them. They were joined by pro-labor groups, Kilusang Mayo Uno (KMU) – Metro Manila, Alyansa ng mga Manggagawa Laban sa Kontraktwalisasyon (ALMA Kontraktwal), Defend Job Philippines, and Kilos Na Manggagawa during their five-day protest campout. “We hope that President Duterte and Labor Secretary Silvestre Bello III will be true to their words that they are doing everything to make their own rulings on regularization become a reality. 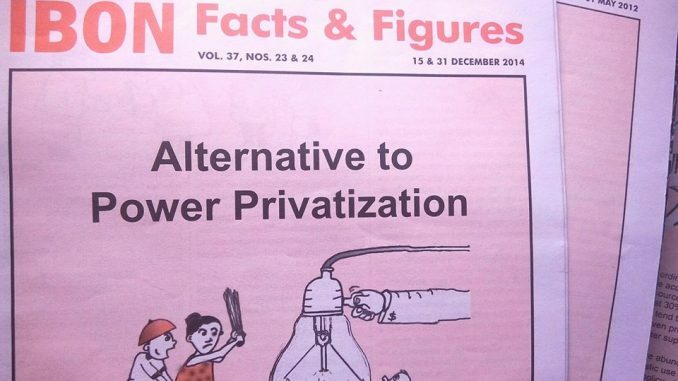 Duterte must show us tangible and significant efforts and results in urging companies like JFC, PLDT among many others to totally regularize its hundreds of thousands of workers,” said Ed Cubelo, KMU Metro Manila chairperson. The groups said that they will be staying in Mendiola until Monday morning and will hold an “Anti-Contractualization Caravan” from Mendiola to the University of the Philippines in Diliman, Quezon City, where they will merge with thousands of protesters before marching to the United People’s SONA 2018 program along Commonwealth Avenue in Quezon City. 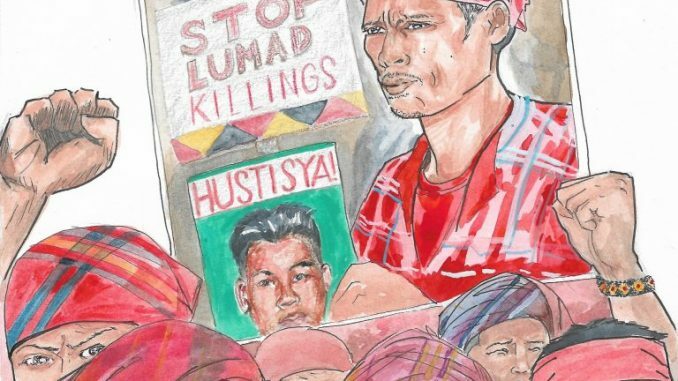 Read: A United People’s SONA. What’s the difference? “Our calls against contractualization and for our regularization will amplify in the sea of people on Monday. President Duterte must fulfill his empty and failed promises to end contractualization and improve the lives of workers if he don’t want himself to be endo by the Filipino people,” Cubelo said. The post #SONA2018 | Church groups, Southern Tagalog marchers set foot in anti-endo camp in Mendiola appeared first on Manila Today.